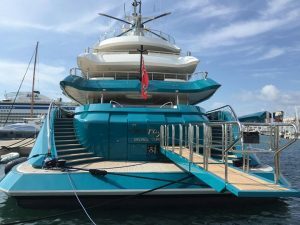 Aqualite Outdoor work with marine architects, super yacht interior designers, luxury boat builders, marine electricians and in fact anyone who needs to be involved to ensure that you get the very best on board AV, entertainment, information and signage digital display system possible. 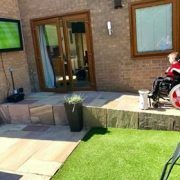 Based in the UK Aqualite Outdoor TV Ltd is a manufacturer of IP66 rated anti glare, heat and cold resistant weather proof and water proof TVs. Available in 26” 32” 42” 55” 65” 70” and 82″ sizes & 2 models (standard brightness & high brightness). Yacht & Super Yacht boat building Company’s such as Van Berge Henegouwen, Sunseeker, Princess, Benneti, Icon Connect, Sitep Yachting have been specifying & installing Aqualite Outdoor all weather and sea water proof TV display screen on deck with success. With this in mind we ask you to take a look at our web site & if the Aqualite range of products look interesting then please contact us, We offer special prices for distributors, resellers, wholesalers & suppliers of marine electronics and marine AV systems. 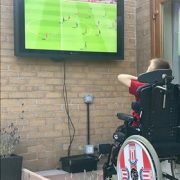 Stoke City Fans, Luka and Steve Bentley, never miss a game at the BET365 Stadium and with an Aqualite Outdoor TV screen installed in their garden, they and their friends are looking forward to watching the 2018 World Cup Finals this summer, come rain or shine. Steve Bentley takes up the story. ”I guess my initial motivation for considering an outdoor TV was quite unusual. My son Luka, who is now 10, has cerebral palsy. His main pleasure in life is watching TV, especially football. 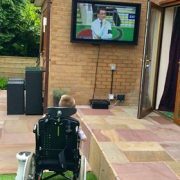 During the summer months, we found ourselves staying inside with Luka, rather than enjoying the garden, and this led me to investigate the possibility of taking a TV outside. Of course, the main issues with trying to watch a regular TV outside soon became apparent. The shiny screen and limited brightness meant that it was often difficult to see the picture. I looked at a number of specialist options, including weather proof casings for standard TV’s, and a number of purpose built outdoor screens. Aqualite were the only company with established credibility in this space, who’s products gave me the level of confidence which I was looking for. The product more than lived up to the hype. It’s always a great talking point, and its perfect for BBQ’s during the football season. Our friends never fail to be impressed; both with the clarity of the picture in daylight, and the fact that the unit permanently resides outside. 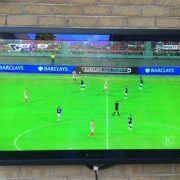 I have made use of complimentary technology with my outdoor TV installation, which includes a wireless HDMI transmitter and receiver, and a wireless solar-powered speaker. It’s a great combination, which allows me to stream content from a Sky or Virgin box, and output the audio to the area where guests are sitting. I have to admit that I was a little sceptical regarding the units durability, especially during the first winter, which was a harsh one, with considerable amounts of snow. Also, living in the North West, rain is never far away. I needn’t have worried. Come the spring time, I switched on the Aqualite TV and it functioned perfectly. That was four years ago, and it has survived every winter since. I consider the Aqualite TV to be one the best purchases I have ever made, and of course Luka loves it too. I’m now looking forward to the World Cup 2018, where the Aqualite screen will no doubt provide the backdrop to plenty of outdoor entertainment, and hopefully some success on the pitch! Kim Menen the managing director of Aqualite Outdoor added, ‘Football is a sport that could have been invented specifically for television and everyone knows that watching the big game is always more fun with your friends. It’s great to hear how much joy our customers get from the Aquaite range of all weather TV screens and we are thrilled with Luca and Steve’s feedback. For more details on the Aqualite Outdoor range of all weather, IP66 LCD and LED display screens please contact us directly.